a boy learning to navigate vessels on River Thames under indentures of apprenticeship issued by Watermen and Lightermen's Company of London. gives general assistance on river or canal barge. a member of crew of river or canal barge, usually either captain or mate (canal barge, etch q.v. assists boat owners in handing trippers into sailing boats, in launching boats, etc., and sometimes himself rows for pleasure party for hourly or other fee; during winter, does odd jobs about beach, e.g. sets lobster pots for fishermen (000) q.v., paints boats for owners. general term applied lo any member of crew of barge, lighter, canal boat, small fishing boat, etc., other than master or mate q.v., who renders general assistance at tiller or in body of boat, as directed by master or mate. an owner of pleasure boats, which he lets out on hire, on lake, in public park, on river, or at seaside resort; either himself cleans boats and keeps them in repair, launches or pulls them out of water, etc., or directs employees to do so. owns rowing boat, which he usually rows himself, licensed by river or harbour authority to ply for hire in waterway, for conveyance of passengers between vessels at anchor in channel and quay, also goods (passengers' luggage, ships' provisions, etc. ); accepts other jobs, e.g., conveying to landing stage or quay, mooring ropes thrown-out from vessel approaching landing stage, rowing out to vessel on entering harbour and conveying letters or messages to shore for convenience of passengers or crew, conveying pilot (733) q.v. to and from ship where no pilot tender is used. a boat keeper q.v. who contracts for supply of boats for a stated period. (ii) a boatman q.v. owning boat in which he conveys Customs officers about harbour, in way described. member of crew of steam barge fitted with crane for lifting machinery, or other heavy, unwieldy cargo from ship's hold, or vice versa; in addition to ordinary duties of bargeman q.v. signals to craneman (736) q.v. when to raise or lower crane falls during lifting operations. a boatman q.v. owning a foyboat, i.e. boat used in and about harbours, e.g. to convey pilots and plying for hire, or doing errands or rendering various small services to shipping therewith. acts as boatman in shipbuilding yard; passes ropes by paying out from coil; goes out to timber pond to gather or select logs, etc. ; salves and secures floating timber, ships' fenders, and other material, after launch of a ship by using a raft in river alongside shipyard, etc. (ii) employed by boat keeper q.v. to attend to customers taking out boats on hire; sees oars, sculls, paddles, sails, etc., complete with boat; books time boat taken and returned, receives customers' payments, makes return of sums received to boat keeper and remits monies to him or pays into bank, as directed; sometimes accompanies parties on trip, with or without other boatman, rowing or sailing boat for them or helping them to do so; often acts as boat labourer q.v. ; in off season, often spends part time in painting and varnishing boats and doing minor repairs thereto, under direction of owner. waits upon boats entering or about to leave port, performing miscellaneous services, taking messages, conveying officers and men, etc. rows or sails boat which conveys stores and relief to lighthouses, lightships, etc., under jurisdiction of Trinity House lighthouse authority for England and Wales), or which takes buoy masters (731) q.v. or workmen to buoys; or is member of crew of larger boat (rowing, sailing, mechanically-propelled) similarly employed. (ii) as for boat keeper. cleans boat; assists in driving horse which pulls boat; and does other similar work on canal boat. 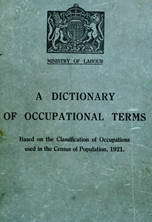 general term for any man employed on a canal boat; usually includes captain and mate (canal boat, etc. ), but may include captain and canal boat boy q.v. in charge of navigation, along rivers and canals, of barge, canal boat, lighter, flat, keel, or other small craft (not sea-going), and is in command of crew; steers barge, etc., by tiller; often, with help of mate q.v., propels boat with long sweeps (oars) or helps in raising or reefing sail, etc. ; stows cargo, and sometimes loads and unloads it; usually does not hold a Board of Trade masters' certificate; cf. captain (733) for officer in charge of sea-going barge; cf. barge man. a captain (river barge, lighter, etc.) q.v., of a flat (name given in Lancashire and Cheshire to lighter). a captain (river barge, lighter, etc.) q.v. or member of crew of canal boat. a boatman q.v. who rows or sculls a small flat-bottomed boat (coble); dialect term. a labourer employed by coal contractor (770) q.v. at coal staith or riverside wharf where extensive coaling operations are carried out; stationed in rowing boat, recovers coal dropped overboard, during loading and unloading of ships, by dredging river bottom with perforated scoop; usually employed part time in sweeping coal and coal dust into heaps on quay. member of crew of a dredger and employed part time as for seaman or deck hand (735) or fireman (736) q.v. ; also helps in dredging operations, e.g. acts as pipe man (749) q.v. on sand pump dredger, or passes signal to craneman (736) q.v. on crane grab dredger. assists ferry man q.v. or himself does work of ferry man on small boat; rows (or helps to row) boat; places gangways in position; moors boat at landing stage; collects fares; on steam qr motor ferry boat, assists ferryman in firing boiler, and in controlling, greasing and oiling engine; sometimes specifically designated, e.g. steam ferry boy. owns one or more ferry boats; usually rows or sails own boat; as for ferryman. plies to and fro across a waterway ferrying persons, livestock, vehicles, etc., in a rowing, sailing, motor or steam-propelled ferry boat, or in a flat-bottomed float, which is punted or pulled across waterway by means of rope or chain working on runners; collects fares or Lolls; places gangways, if required, from boat to bank or landing stage, during embarkation, etc. ; moors ferry boat to landing stage with mooring rope; on motor or steam-propelled boats, also controls and fills petrol tanks, stokes furnace, greases and oils engine. Lancashire and Cheshire terms for lighter boy, lighterman q.v. a boatman q.v. who rows or sails a rectangular boat (a "float") resembling a punt. is responsible to lighter owner for care and management of lighters; instructs lightermen q.v. as to disposal of lighters in dock or at quay; arranges for tugs to tow lighters from point to point as required; sees that lighters are expeditiously loaded and discharged by dock labourers (745) q.v. ; marshals lighters alongside dock, quay or vessel for loading and unloading purposes. a waterman or a lighterman q.v. who is a member of Watermen and Lightermen's Company of London, and who has served his full time of apprenticeship on river. walks along towing path by side of canal or river, and pulls canal boat or barge with a rope; usually done by master or mate of barge q.v. rows or sculls small boat (in docks or rivers), in which he acts as unlicensed pilot, or does odd jobs. a hobbler q.v. who rows dock pilots from point to point as required. assists on board a hopper; cf. hopperman. member of crew of hopper barge (into which material is discharged from dredger); as for barge man. leads or rides chain horse (i.e. trace or leading horse) where two or more horses are used to tow boat or barge along river or canal; when not so employed, sometimes does any other work on, or in connection with, boat or barge. leads or rides, between prescribed stages, horse which tows barge or boat along canal with a long chain or rope; feeds and waters horse, if required, between stages; returns horse to stable for attention by stableman (725) q.v. on completion of journey; at small canal horse depot, acts as own stableman. a master q.v. or member of crew of a "hoy," a large single-decked sailing barge commonly rigged as a sloop. as for barge captain; a "keel" is a flat-bottomed barge used in Yorkshire on waterways with short lock pits. either captain or mate of "keel" (cf. keelman master); often son of captain acts as mate; as for barge man. a master q.v. or member of crew of a ketch, a small sailing barge in and about the port of Hull. hauls boats from boathouse to water and vice versa; at seaside resorts, hauls, or assists in hauling, boats up beach out of reach of tide, or hauls down beach as tide falls, and as required by customers; fetches oars, sculls, sails, thwarts, rudders, etc., from boathouse or store and returns them thereto after use; often sent out with party to row or sail boat for them, either alone, or if with boatman q.v. assists generally; usually so employed during boating season only; during off season, either finds other work or is employed in painting, etc., boats and doing minor repairs thereto. assists in miscellaneous duties on a, launch or pleasure steamer. propels barges or canal boats through low tunnels by lying on his back on top of barge and 'pushing barge along by pressing with his feet on roof of tunnel. member of a life-boat crew (whole-time or part-time occupation); assists in cleaning station, i.e. in washing, polishing and cleaning gear; takes part in practice runs; may undertake station work (watch or look-out) at certain times, e.g. bad weather, as determined by lifeboat captain; is usually a fisherman (000) q.v. or pursues other calling besides that of lifeboatman, when a part-time member of crew. does any odd jobs on lighter, e.g. fixing lighter's mooring ropes to quay posts, and unlashing when lighter moves away, and assists lighter captain and other lightermen q.v. (if any) generally; often captain's son and acts as mate q.v. member of crew of lighter, a large barge like craft used on rivers and sometimes towed round coast; may be a contract man, i.e. an ex-sailing barge man who has contracted to an employer to serve 2 years for a contract licence, or a fully apprenticed waterman; assists in navigation and in stowing cargo, as for barge man. general term applicable to any member of deck crew of any type of vessel (steamship, sailing ship, lighter, barge, ketch, etc. ) navigating river, including captain, mate, barge man, keelman, ketchman q.v. see captain (river barge, lighter, etc.). assists captain q.v. in navigation of barge, lighter, canal boat, flat, keel, etc. ; takes turn at tiller; if on barge, propels barge along waterway by punting with long pole, or, leads or rides horse drawing barge; moors vessel alongside quay or landing stage and, except on barge, assists in loading or unloading; cf. mate (733). barge man. wife of captain q.v. of canal boat; as for mate (on barge, canal boat, etc.). a barge man q.v. who undertakes short trip on barge as extra hand for an agreed sum; as for mate (on barge, canal boat, etc.). takes charge of barge or barges mooted to buoy in barges roads; moors and unmoors barges; may also be in charge of string of (say) seven barges moored one against another from wharf outwards into river. member of crew of barge transporting sand. does odd jobs in small boat which he propels and steers about dock, river, etc., with single scull plied from stern of boat. a master q.v. or a member of crew of a sloop (cutter-rigged sailing barge). a master or member of crew working on a dredger which keeps a channel clear by trawling. owner of small fishing boat having open well in bottom for keeping fish alive until landed; lets-out boat on hire to persons fishing for pleasure at sea-side resorts; accompanies fishing party, if desired, and baits hooks with live bait kept in well of boat. a boatman q.v. licensed after 5, 6 or 7 years apprenticeship, to carry passengers and to ply for hire on inland waterways, frequently owning his own boat; usually also licensed as a lighterman; has knowledge of tides, waterways and docks in his district; cf. waterman (741), dock pilot (733). plies for hire between shore and coal boats (colliers) conveying officers and crews, or coal heavers, or fetching mooring cables, etc. a boatman q.v. who takes pilot out to a vessel in channel or midstream. a master q.v. or member of crew of a wherry or sailing barge of light draft used on inland waterways, e.g. Norfolk broads.